The overburden pressure (OBP) is the stress due to the weight of overlying rock. This is calculated through integration of density, either via analytic extension of logs (1D well calibration mode) or a transform of velocity volume (3D model building mode). Air density — for log above sea level (if applicable). Water density — for depths from sea level to the sea floor (default to 1.02 g/cc). Default shallow power — power-law exponent to apply from the sea floor to the first log sample. Default deep power — exponent to use below the logged zone. Density volume (in TVD) — volume to use when Use density from volume is selected. Note: The water depth must be correct in the well configuration. To view or change the well configuration, open the Well tab in the Control Panel, and double-click the desired well (see Figure 8). Shallow zone — defines the zone from the sea floor to the (allocated) log depth. Extrapolate up from — defines the first log depth from which to begin the density extrapolation up to the sea floor. Zero (0) will use the first logged sample. Override Power — if checked, will be applied for the current well only. Deep zone — defines the zone from the last log depth to the base of Display Window. Extrapolate down — either from a user-defined depth, from the last log sample, or do not extrapolate. Method — either power-law or polynomial GGG relationship. To calculate PPP volumes, an OBP volume is also required. 3D Model Building shows how to create a density volume, which is used to calculate the OBP volume. 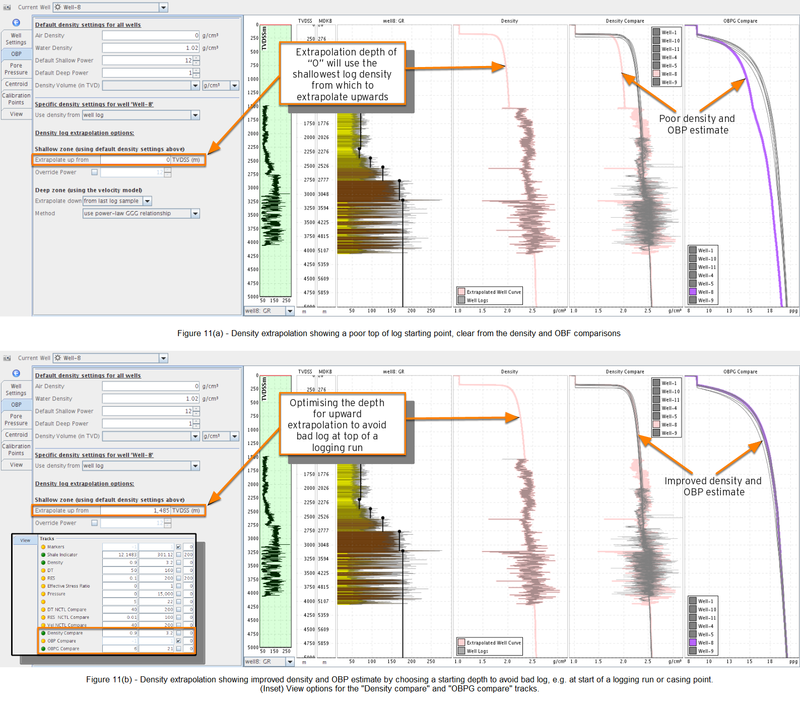 In the Tracks section of the View tab, enable OBPG Compare, allowing you to verify that all wells have similar trends. Figure 11 shows how simply adjusting the Extrapolate up from value can minimise well-to-well variability. Note: The Extrapolated Well Curve option will exist only when Use density from well log is selected. 3D Model Building, Figure 29 shows the same comparisons made with Use density from volume.